Amanda Brooke is known most notably for her debut novel Yesterday's Sun which was a Richard and Judy book club pick back in 2012. Since then she has written a plethora of books, of which I have read Another Way to Fall and The Child's Secret and love both of them, so when I got asked to feature her latest book on my blog, I of course said yes. 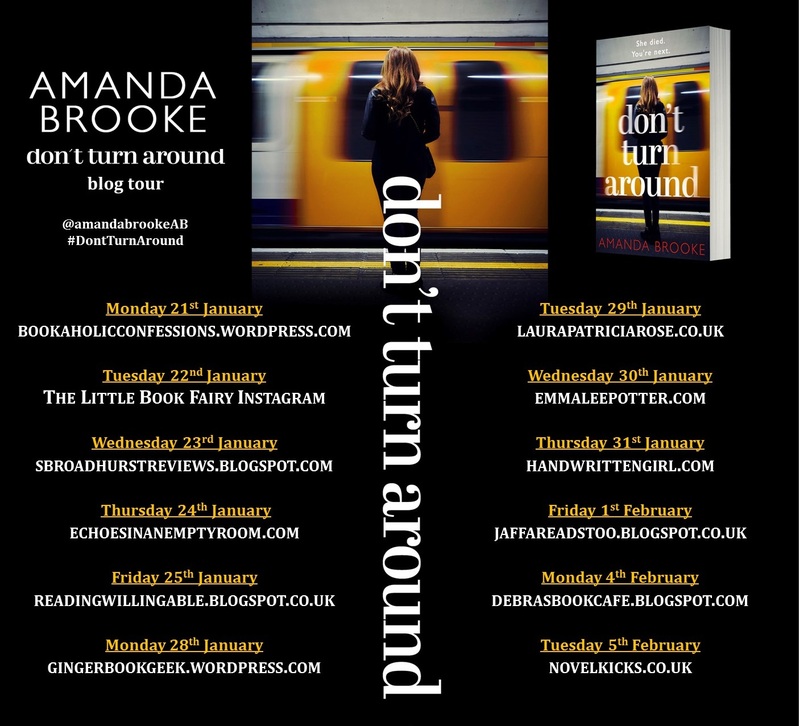 As part of the blog tour, I get to feature an exclusive extract for you to tickle your tastebuds. I was always the shy one, hiding behind Meg’s armour of overconfidence. She could jump from a stage and never doubt that someone would catch her, while to this day I refuse to step into a lift because I’m convinced a cable will snap. Unlike Meg, I’ve never put my fears to the test but then I don’t need to. Bad things do happen – Meg proved that. It would have been nice if my response to my cousin’s premature death had been to grab every opportunity that life had to offer, but I didn’t see the point. Not all leaps of faith ended well, so why take the risk? Much to my mother’s chagrin, I turned down my place at university and denied her a full complement of four daughters with degrees, husbands and successful careers. In her eyes, I’ve failed on all counts. I spent the years I should have been at uni flitting from one casual job to another until Ruth asked for my help setting up the foundation. She had commandeered a corner of the new offices of McCoy and Pace Architects and she wanted my help to launch the Lean On Me helpline. The role was voluntary, the charity couldn’t afford paid staff or much else for that matter, but Ruth found a way around that by employing me as an admin assistant and allowing me to split my time between the firm and the foundation. I was reluctant at first, and Mum wasn’t too pleased that I was being offered such a lowly position in her brother’s firm, but I wasn’t looking for favours from Auntie Ruth and Uncle Geoff. They became simply Ruth and Geoff as we adjusted to our new roles in each other’s lives, and although certain aspects of the work can be a challenge, I’ve been surprised by how much satisfaction I’ve gained from helping others through the charity. I’m less keen on my admin duties but, if the relaunch of the helpline is a success, if we secure more funding and reach out to more people, then I plan to start training to be a counsellor. It’s by no means guaranteed and I share Ruth’s desperation, but I’d like to believe that Meg is steering me towards a career I never knew I wanted. This relaunch has to work. When I lift my head, Ruth is beaming a smile at the reporter. She’s in full flow, talking about the helpline. It might not be on the grand scale of some of the national charities we work with like the Samaritans, Women’s Aid and Refuge who can offer twenty-four-hour support but, for three evenings a week, we are there for young people who often have nothing more than a growing sense of unease about a relationship and want to talk it through. A listening ear might not sound like much, but we’ve had enough successes to make the last seven years worthwhile, and long may it continue. A shadow appears in my periphery and I turn to find Geoff with his shoulder pressed against the window. ‘I wish you wouldn’t do that,’ I whisper, my pulse racing as I imagine a creak as the window frame loosens, followed by the sound of glass and bone shattering on the concourse below. Like Ruth, my uncle’s tailored appearance gives no hint of the trauma he’s suffered. He was the one who found Meg in the garage but if the shadow of that memory persists, it’s hidden behind the twinkle in his grey eyes. The only marked difference I’ve noticed in the past decade is a receding hairline and the slight paunch he carries as a result of too many whiskeys. ‘How’s it going?’ he asks, tipping his head towards Ruth. I attempt a smile but my eyes give something away. I want to give my uncle a hug but that would simply acknowledge the pain he tries so hard to hide. ‘It’ll be worth it if just one person sees the interview and reaches out,’ I tell him. ‘It’s a lot of effort to go to for one person, Jennifer,’ he warns.